You are looking at a pair of Cowgirl Baby Booties. These adorable booties will make a perfect gift for the little cowgirl in your life. 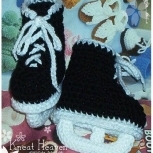 sized in any size from newborn to 9 months.